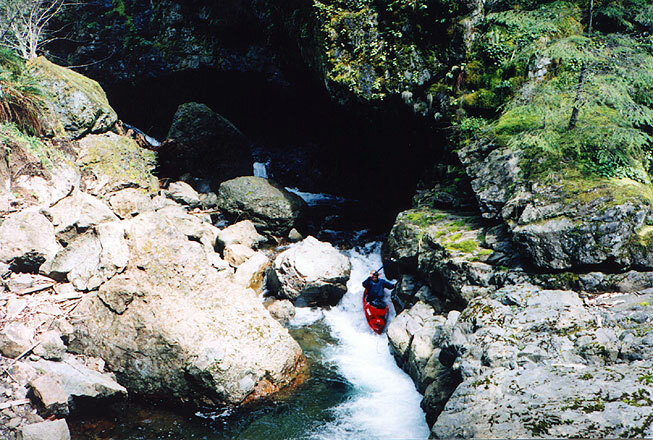 This report details our low water exploratory run down Stebbins Creek. This run has generated a lot of interest since we did it for it's relatively easy access and big, clean drops... Since this adventure we have returned with much more water and have always had a great time! I hope you get a chance to run this wonderful little creek sometime; if you do, let me know how it goes! 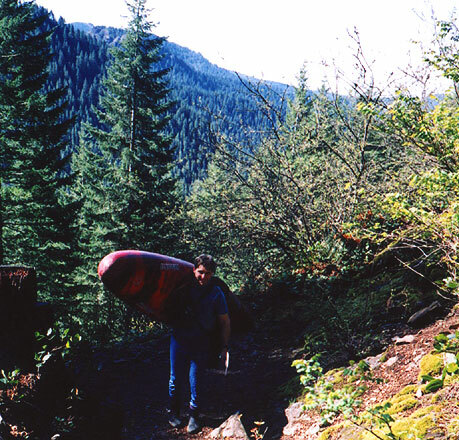 We almost didn't run Stebbins- I had been thinking about running the Upper Upper Washougal all the way up from Corvallis and when I met John at the put in we debated which run we should do first. John was pretty adamant about wanting to run Brice Canyon, especially since he had hiked to the put in the week before. Finally we agreed that Stebbins was dropping so fast that it was now or never. With this in mind we ran the short shuttle, packed up our gear, and started carrying our boats up the mountain... Depending on your fitness level, the four mile hike to the put in can be done in two to three hours. The trail is very popular with hikers for good reason- it winds through a beautiful second growth forest and commands some spectacular views once you reach the ridge line above the canyon. We arrived at the put-in in about two hours by running on all of the flat and downhill sections of the trail and stopping only briefly to rest. I feel obligated to say that the hike is not easy- the trail gains about seven hundred feet and has about as many switchbacks! 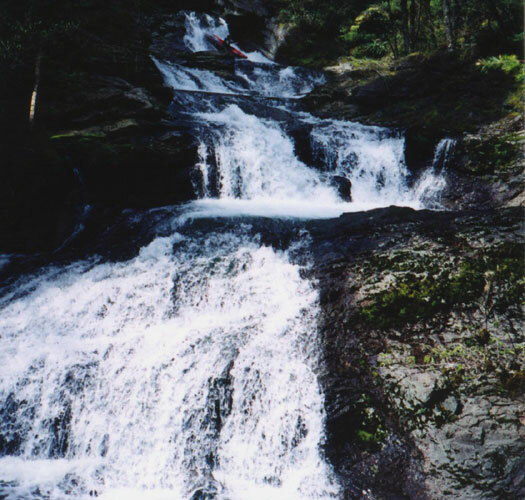 Below this first falls is a long rock slide that ends in a second waterfall. We jumped out, scouted, and then ran this one a couple of times too! John dubbed this one 'Jetboat Falls' because the runout is a thrillingly steep slide that shoots you to the left, where you just miss protruding rock wall- it was great fun! Below Jetboat the creek gradually started to reveal its true nature and astounding gradient as we encountered more big ledges and towering boulder gardens. We scouted all blind drops and in doing so were amazed by the lush scenery and peculiar rock formations. There was no dangerous wood until we got to the next waterfall. While John celebrated incoherently I jogged up to my boat and slid into the pool above the monstrous horizon line... When I reached the lip of the first tier the view was so unbelievable that I almost forgot where I was... Oh yeah! the LOG! I boofed hard left and man oh man I thought I was going under the log but I shot past it and was over the second tier before I could blink! 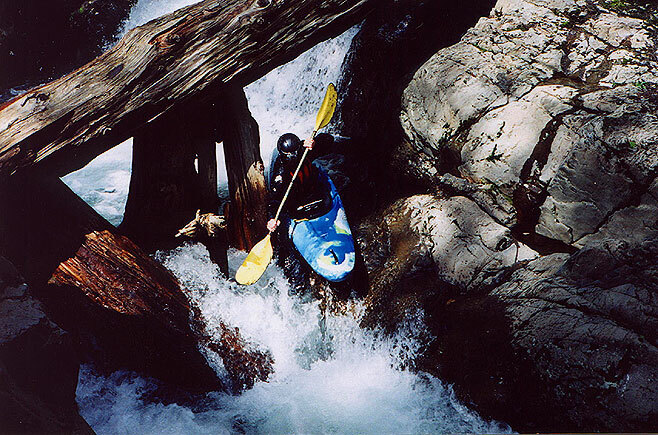 I was going so fast that I struggled to maintain my bearings as I quickly moved right and dropped over the third tier, plunging deep and then instantly I was up and paddling hard to the right where I shot down the forty foot long smooth chute like a rocket. At this point I was accelerating so fast I thought I was going to end up in the the trees on the far shore! I started whooping like a maniac and after that it was a race to see who could get back to the top and run it again!! 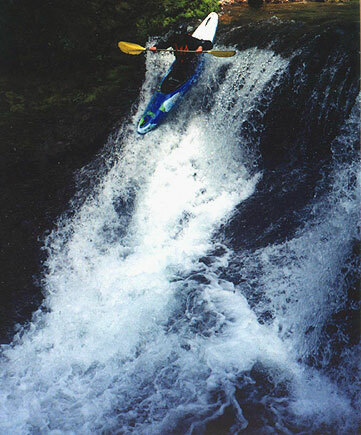 We both ran it twice and John said after twenty six years of paddling and over 270 rivers this drop was one of the best he has ever run. You know, it might sound strange, but I am going to dream about this one! After this drop we were so addled with adrenaline that we blissfully bashed down the next few drops until we arrived at the second indescribable drop which we dubbed 'The Zoom Tube.' Here the creek plunges into a steep boulder garden that drops around a right corner with a huge overhanging rock wall looming overhead. The sound of the water is greatly amplified by the half moon curve of the wall as the creek races down along the wall over three distinct drops. 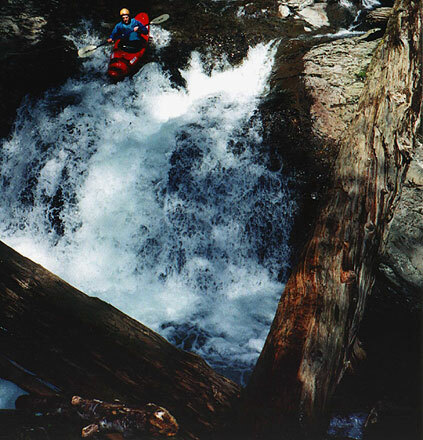 John portaged the first drop, and since he has been paddling almost as long as I have been alive, I should have followed his example. Unfortunately I didn't because I thought for sure first slot would go, no matter how horrible it looked..
My next well deserved beating was much worse and occurred just down stream. The creek disappeared again around an narrow, twisty drop which from upstream it looked like a straightforward airplane turn but I scouted quickly anyway just to be on the safe side. Good thing I did! Just around the corner and out of sight the turn was partially blocked on the outside corner by a jagged, evil looking boulder. John was in the eddy above and I shouted directions to him. "Airplane turn- Be sure that you make a hard left in the chute to avoid the rock on the right!!" He nodded and flew down into the chute and bashed straight into the rock. 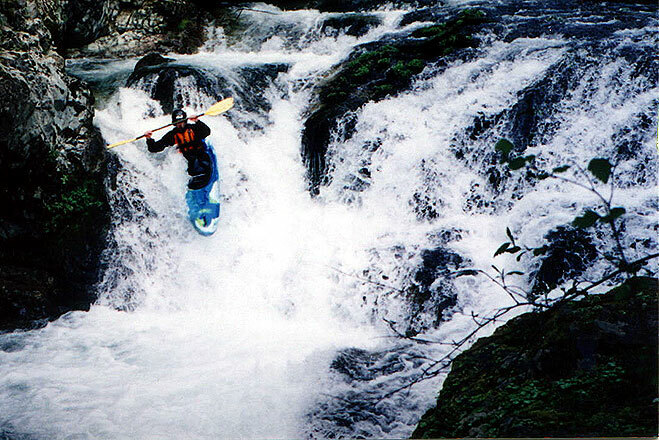 He bounced right into an eddy and then spun around and flushed through cleanly. "I wouldn't have run that if I had looked at it!!" he shouted unhappily. I should have portaged but I thought I could correct off of Johns line.. I was in a bit of pain now so was I ready to be done, though for John's sake I tried to keep my whining to a minimum as the creek mellowed for about a half mile of really peaceful and scenic class II-III. Just above the takeout the creek turned sharply to the right and plunged over the final waterfall just above the take out. We both went completely under the surface on this technical plunge falls, which was a thrilling and refreshing way to end the day! Access: Access and Flows: Stebbins has a tiny drainage so it only runs after a few days of rain in the spring or early summer and all during the rainy season. To determine if there is enough water in the creek, look downstream from the put in bridge on the right side of the channel; the rocks in the channel on this side should be covered. Look upstream to scout Mad Dog Falls. 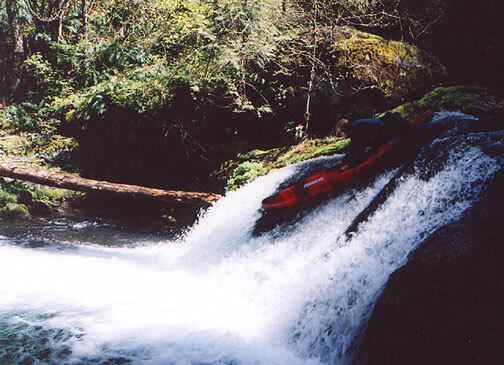 To get to the take out, follow the directions in the guides to Doc's Drop on the waterfall run on the Washougal River in Washington. Just downstream from Docs is a bridge over Stebbins where you get a very nice view of Mad Dog Falls. This is the take out. To get to the put in, head up the gravel road (known as W2000) about 1.8 miles above Docs Drop stay right and about 2.3 miles later you come to the top of Deer Creek divide. Once you cross the first wooden bridge across Deer Creek turn right and drive about 2.25 miles to a four way intersection. Turn right again here (following the signs to Beacon Rock and road 1440) about 2.5 miles later just before milepost 12 the road crosses the diminutive North Fork of Stebbins Creek. On the far side of the creek on the right hand side of the road follow the signs pictured at the beginning of this trip report down to the confluence, which is about a two mile mostly downhill hike on a good trail. Flows: A reasonable flow might be EF Lewis at Heisson 1200 cfs after a couple of days of rain. When we did it EF Lewis gauge was at 600 and it had just rained pretty hard. This was too low- maybe double the flow we ran it at would be more reasonable. Stebbins is rain fed and is very sensitive to rainfall due to the bedrock that forms most of the creek bed. The creek doesn't have a lot of wood because it gets incredibly high in the winter (as evidenced by the old growth logs tossed high into the underbrush along the banks in places). There are no substantial tributaries between the confluence of the North and South Forks and the take out, so what you see at the take out is what you will get higher up. At the take out on the bridge over Stebbins look downstream just above where the creek joins the Washougal. All of the small rocks in the right side of the creek bed should be slightly covered for an optimal run. When we ran it many of the rocks were uncovered, which was really too low.